As you’ve read in the daily programme, we have set times for activities with your child. Nobody is forced to participate, but we do encourage the children to try out new things. We stimulate them to learn actively and work out solutions for themselves. It’s how your child learns to understand and value itself – and this strengthens their motivation, self-confidence and independence. Your child may also leave the group at certain times for a specific activity. Depending on the age of your child, we organise trips out to drama and dance lessons, musical activities or yoga sessions. 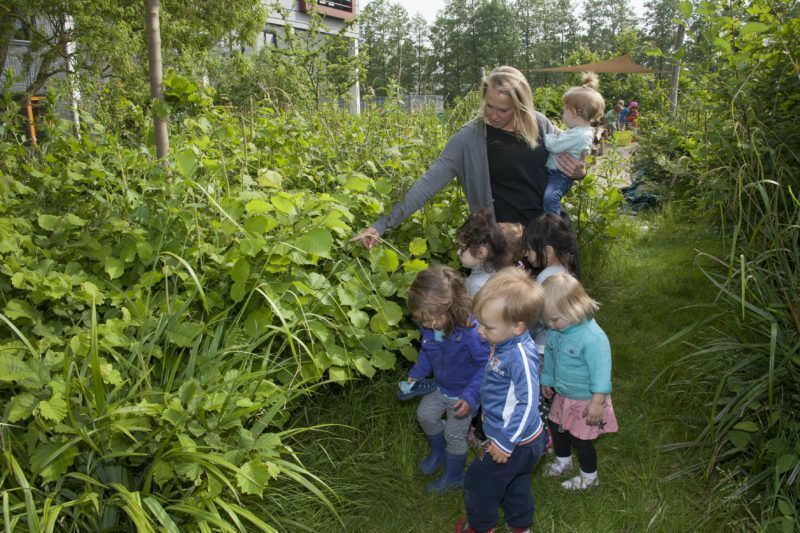 All our centres have a weekly programme for toddlers called SpeelRijk (‘PlayKingdom’). A dance teacher, musician or artist comes to the centre to dance, make music or make art in the children’s studio using exciting materials such as masking tape, kitchen foil and other wonderful remnants. Whatever the weather, all the children go outdoors every day. Your child is wonderfully active in the fresh air and can run, climb, slide, jump or hide. And at the same time, they can develop a respect for nature. Each age range demands a different outdoor setup. Areas for the littlest one have more attention paid to being able to make discoveries and explore boundaries safely; the older children need more challenges. Most of our centres have special natural play areas with sand, stone, wood, waterslides, plants, shells, vegetable gardens and much, much more. It’s an exciting environment that encourages adventurous and imaginative play. In addition to the group activities, your child gets plenty of time each day for free play. At KinderRijk, we pay a lot of attention to the layout and furnishings, and the variety of materials used in all our indoor and outdoor areas. The areas offer peace and quiet and are safe but challenging. They rouse curiosity and creativity. The playthings are set out invitingly at eye level, so your child can easily pick what they want to play with. Not all the playthings come from a shop or were designed as a toy. If they use their imagination, children can also play endlessly with things such as wooden spoons, egg boxes, empty milk cartons, pieces of fabric and blocks of wood. Finally, we have certain routines at KinderRijk that help us mark different moments. Routine provides structure to the day and gives your child a sense of security. Starting the day together with a game, story or discussion, washing our hands and singing a song together before we eat, and a set pattern to saying hello and goodbye; they’re all routines that form part of each day.